DHAKA, June 6 (NsNewsWire) — Bangladesh is not in the FIFA World Cup 2018 competition but the world’s most-watched sports tournament still attracts throngs of soccer supporters from the nation’s population of 160 million, reports Xinhua. The country is gearing up for the tournament kicking off in Russia on June 14 and fans here are eagerly awaiting the hosts opening their campaign against Saudi Arabia. During the World Cup, fans here would wear the jerseys of iconic players and hoist flags of the their favorite teams at their homes, in streets, schools and even on rooftops of cars and buses. 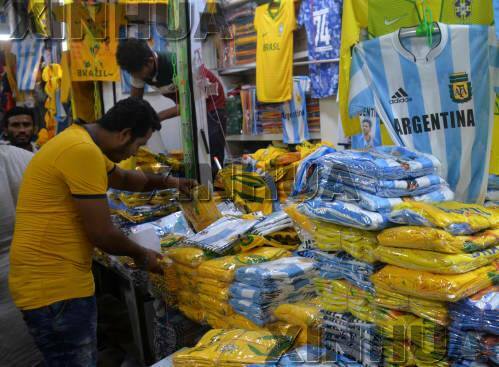 This year’s World Cup is no different, with wholesale and retail markets in Dhaka‘s abuzz with football fans. Most of those scouring the markets are teenagers and college students who are huge fans of soccer, but children of all ages, including toddlers, come with their parents to buy World Cup jerseys. With only about two weeks left until the World Cup kicks off, shopping has started gaining momentum here, with fans busy buying soccer-related accessories, especially jerseys and flags. Hawkers are also selling jerseys and flags along the busy streets and in the downtown area of the city. Traders say the buying spree will continue until the last day of the World Cup. For flag-maker Mohammad Fazlu, this is an extremely busy season. “I don’t even have time to catch my breath as I’m so busy making flags,” said Fazlu, who has been making flags for 18 years. He said he can make the flags of all the countries in the world and such is the demand from local Bangladeshis. As a result, he barely has time to sleep. “I love my job, but I usually don’t finish until 3:00 a.m. during World Cup days,” Fazlu said. To meet the ever-increasing demands of fans, markets and shops along the Gulistan streets are also flooded with imported products, especially goods from China. “There is huge demand for such Chinese products, so we can sell a lot,” Raihan said. Raihan added that they sell about 2,000 flags of the participating countries daily. Ishtiaq Ahmed Shuvo is a football fanatic from the Narayanganj district, some 30 km northeast of the capital city. He’s been trawling the Gulistan streets in search of flags and replica jerseys. “These flags from China are awesome, they’re such great quality and well-priced,” Shuvo said with delight. Cricket-mad Bangladesh goes crazy for soccer during the World Cup and supporters of Argentina and Brazil even scuffle on the streets.